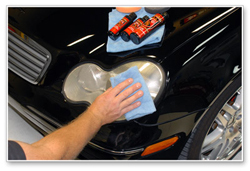 Restore double the number of headlights, still at a fraction of the cost of lens replacement! The Wolfgang Professional Plastik Lens Cleaning Kit contains double the products and pads of the original Wolfgang Plastik Lens Cleaning Kit. Clean and restore double the headlights, taillights, and hard plastics. The Wolfgang Professional Plastik Lens Cleaning Kit is a three step kit that removes oxidation, clears up yellowing, and polishes clear plastic to like-new clarity. Cloudy, scratched headlight lens covers are a safety hazard as well as a blemish on your vehicle. This condition occurs because the plastic is overexposed to UV light. The cloudiness starts at the exterior surface of the lens cover and spreads inward. If caught quickly, this damage can be removed by simply polishing the plastic until it is clear again. After polishing your lens covers with Plastik Lens Cleaner, use Wolfgang Plastik Lens Glaze to refine the surface. The glaze has mild cleaning properties to make the surface smooth and slick again. It works like a finishing polish to restore the plastic's texture. Wolfgang Plastik Surface Sealant forms a clear barrier over your plastic lenses to shield them from contamination and UV rays. 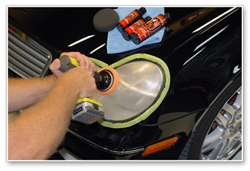 The sealant is formulated to seal clear plastic without streaking or yellowing. 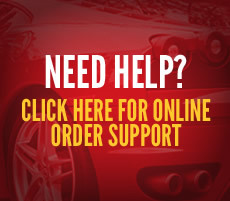 It dries crystal clear so your headlights look and perform better. Rather than lighting the road ahead with a dull, filtered glow, you'll see bright beams of light shining on everything in your path. 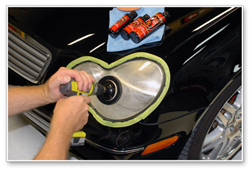 It's much safer and your vehicle will look great with a clean set of lenses. By blocking out UV rays, this sealant prevents the clouding that occurs on older lenses. Wolfgang Plastik Surface Sealant is just one more way to maintain your vehicle's youthful appearance! You'll receive step by step instructions inside your lens kit. Depending on the severity of the lenses, one kit can restore an average of 12 pairs of headlights. 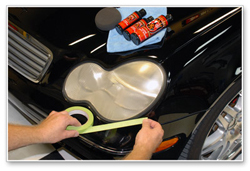 The Wolfgang Deluxe Plastik Lens Cleaning Kit costs about $7.50 per pair of headlights! 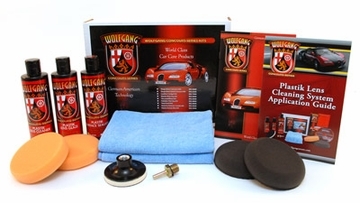 If you only need to restore your own vehicle's headlights, get the smaller Wolfgang Plastik Lens Cleaning Kit (available below). A $118.91 Value. Save $28.92!